With the simplicity of Weebly and the beauty of Squarespace, I’m not surprised that you’re having trouble trying to decide between these two popular platforms. The aim of this comparison is to compare these two popular platforms in the most important areas such as ease of use, template designs, flexibility, help & support and finally pricing. The end goal here is to allow you to understand each website builder and figure out which one is best for you. With that in mind, let’s get stuck in! 1. Is Weebly or Squarespace Easier To Use? 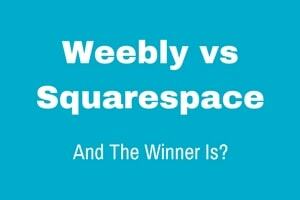 2. Who Has The Best Templates, Weebly or Squarespace? From my experience, people looking to create website rarely go out looking for a platform that’s going to take them months to master and I’m going to assume that you also fall into that group. Ease of use is always one of the major factors when choosing a website builder so let’s see how they fair up below. If a child approached me and asked me how to create a website, I’d point them to Weebly. It’s without doubt, the easiest website builder that I’ve reviewed so far. It only takes a couple of minutes to get started. Simply enter your name and email address, decide whether you wish to sell products (you can change your mind later), choose a design template and then choose a free website address or you’ll also have the option of purchasing your own. Once you’ve completed the above, you’re ready to begin creating your website. The first thing you’ll notice is a handy little box in the bottom right-hand corner of the screen that’ll show you the basics such as adding text, images, and adding new pages etc. Even though Weebly’s simple to use, it’s worth a couple of minutes of your time flicking through these mini tutorials as it’ll save you having to figure it out on your own. You create your website by dragging over elements such as text, images, and forms all of which are conveniently situated on the left-hand side of the screen as well as the main menu at the top of the screen. You simply point, click, and then drag them over to your page and they will automatically lock-in to the closest position available. Squarespace is just as easy to get started with the addition of a few simple questions about your new site which you can skip if you wish. You begin editing your website by clicking on a particular element and a panel will appear where you can edit the settings for that feature. Over on the left-hand side of the screen, you’ll find a menu that allows you edit your site in minute detail. As great as that is, these options can become overwhelming and even frustrating if this is your first time creating a website and where I believe Squarespace get a little less user-friendly that Weebly. You’ll save yourself some of that frustration if you take the time to watch some of the training before hand and get to grips with the settings you’ll need and more importantly, the ones you don’t. Weebly is the easiest website builder out of the two platforms for complete novices. In fact, Weebly is one of the easiest website builders period. There’s nothing particularly difficult about Squarespace, it just takes a little more time to get used to and as I said above, many of the tools you’ll probably never even use anyway. Having said that, if you are willing to spend the time learning the ins and outs of Squarespace, you’ll have much more control over your site than Weebly and ultimately, a more professional end product. 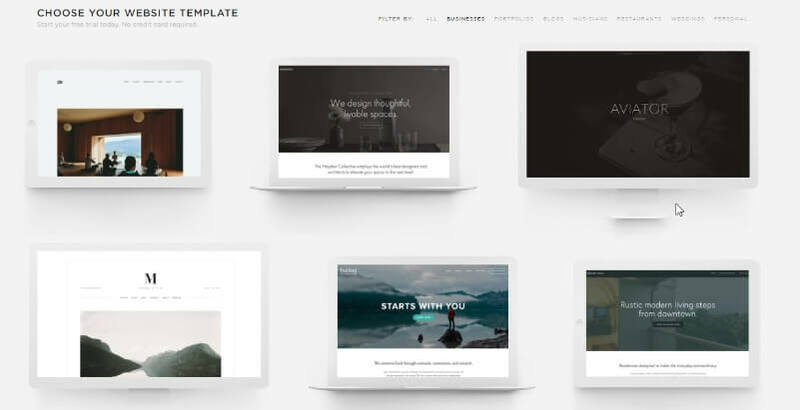 One of your first jobs after signing up to either website builder is to choose a template. It’s this template or design that’ll decide the look and feel of your site. I like Weebly’s templates, I do. But as I scroll through them, none of them really jump out at me in comparison with other website builders on the market, especially Squarespace. I think a fair analysis is that they are pretty average. However, when you add a new page, you’ll be presented with a range of pre-designed layouts which will save you staring at a blank screen for hours wondering where to begin. These layouts are pre-populated with content and images and great for people who like me, don’t have an artistic bone in their body. Also, should you get halfway through your site and wish you’d chosen a different template, you can change it at any time. I know it may sound like this option should come as standard with all website builders but believe me, it doesn’t. Squarespace templates are a notch above Weebly’s and quite frankly, above all of the other website builders I’ve come across to date. Like Weebly, there aren’t many of them but you can tell the Squarespace design team have definitely gone for quality over quantity here and it certainly shows. While you can customize any of these templates beyond recognition and manipulate them to fit your business, they definitely lend themselves to people who have great quality images to show off such as photographers for example. Like Weebly, you can also choose another template at any time should you fancy a change and your content will carry over with you. While I love the pre-designed page layouts of Weebly as they really do make life easier, but Squarespace definitely outclass them when it comes to design and quality. Once you have the basic framework, it’s time to start adding functionality depending on your goals for your website. #1. 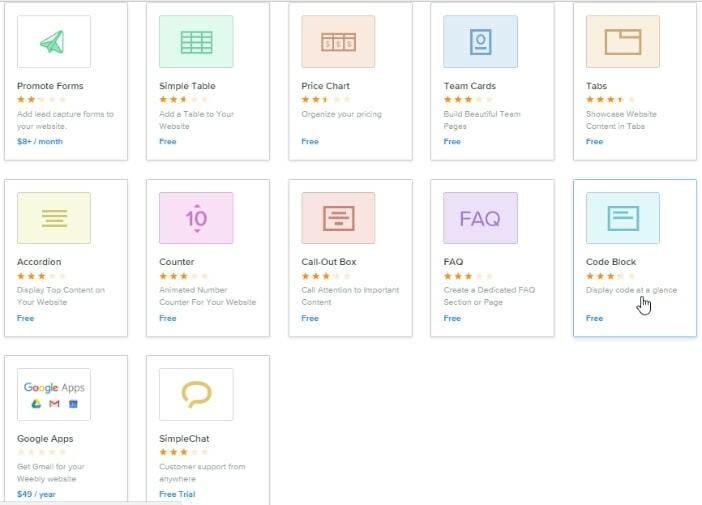 Weebly App Center: The App center makes it easy to add functionality to your new site. You can add online booking, social media buttons, and live chat in just a couple of clicks and that doesn’t even scratch the surface. #2. Membership features: People can register to become members of your website and you have full control of what content they have access to. #1. SSL security: Shows a little green padlock in your visitors’ browser to signal that your site is secure. Available on all plans. Weebly also offers this feature but only on their most expensive plan. Mobile responsive: Your site will look good and work correctly on mobile devices. eCommerce capabilities: Ability to create an online store selling products and accepting payments online. SEO settings: Both website builders allow you to change page titles, descriptions and URL’s to help the search engines better understand your site. When it comes to adding functionality to your site, I found the process a lot smoother with Weebly thanks to their dedicated App Center. At some point during your website building journey, there’s a very good chance that may need to contact the support team whether it’s a technical, account or billing issue. With that in mind, the help and support platform is something I take very seriously when reviewing a website builder. Weebly’s so simple that there’s a good chance that you may never need to contact the support team with a technical issue. Especially if you take some time to watch some of their step-by-step training videos before getting started. 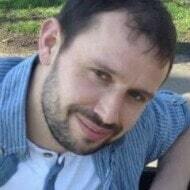 Having said that, if you do find yourself stuck, or run into a technical or billing issue, you can contact them via community forum, live chat, email support ticket or phone. Although Squarespace may take a little longer to get to grips with than Weebly, you definitely won’t be left to figure it out on your own. They have an archive of up to date written tutorials and videos covering just about every aspect of setting up and creating your website. If you need help from a real human being, you could try the members’ support forum which, to be honest, I found to be a little slow. With that in mind, you’d be better of jumping onto live chat to get instant help or you could submit a support ticket and receive a response by email. When I tested it, I had a reply within the hour. With that in mind, you’d be better of jumping onto live chat to get instant help or you could submit a support ticket and receive a response by email. When I tested it, I had a reply within the hour! However, Squarespace did respond a lot quicker to my support ticket and I also prefer their tutorials. I’ll be the first to admit that it can be quite difficult to match website builder plans like-for-like as no two are the same but I’ll do my best! Right out of the gate, Weebly offers a free plan where you can choose to create a free website and access to basic website tools. You’ll have to use a free website address which includes Weebly branding such as yournewsite.Weebly.com, no option to use your own domain. Weebly advertisement displayed on your site (albeit a fairly discreet one). Limited as to what functionality you can add. Weebly’s premium plans start at $8 per month for their personal plan and go all the way up to $38 per month depending on your requirements. The prices shown above are for when billed for 1 year in advance. You can choose a monthly or 6-month option which is slightly more expensive or a 2-year plan which works out cheaper. 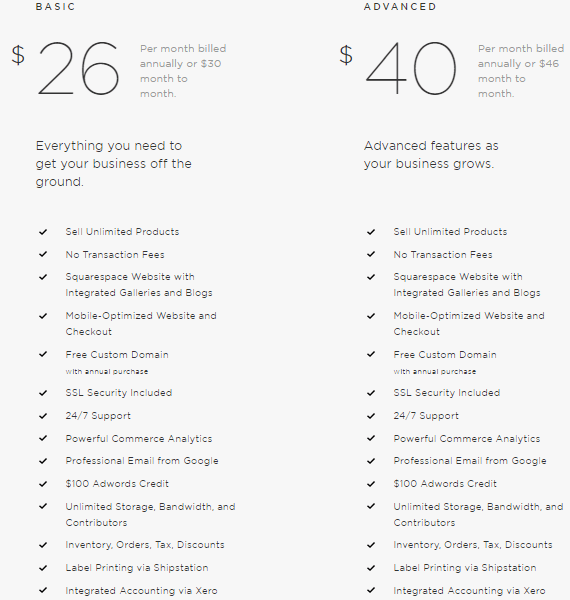 The first thing I should mention is that unfortunately, Squarespace doesn’t offer a free plan. They do however have a 14-day free trial in which you can test them out without financial commitment. After the 14 days, you’ll need to decide whether you wish to continue and if so, you’ll be required to upgrade to one of their premium plans. 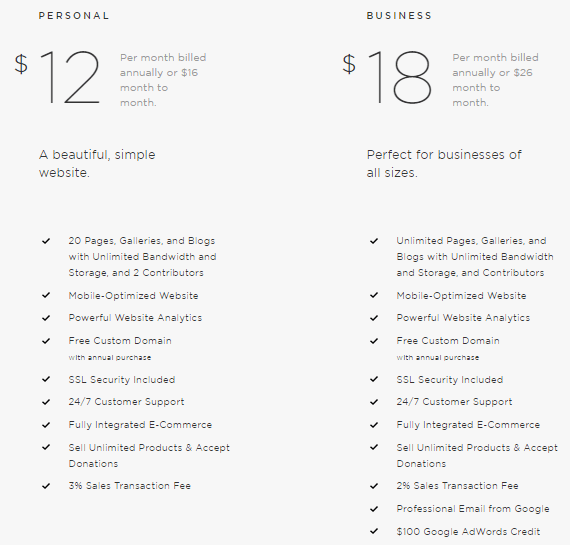 I actually like Squarespace’s pricing structure as it’s fairly simple. They have two plans for regular websites and two plans for eCommerce sites. You can add a store to a regular site, but you’ll have to pay a commission on each sale. Moral of the story, if you intend on selling products right out the gate, an eCommerce plan may be a better option. I don’t think there’s a large enough difference in pricing to allow you to choose one platform over the other. If you’re only looking to build a personal website then Weebly’s free plan may be the way to go. If you’re looking to create a business website you’ll probably need Weebly’s Pro Plan which will set you back $12 per month or Squarespace’s Personal Plan also $12 per month which will allow you to create a great looking professional site despite its name. Should you have an eCommerce store in mind, you should take a closer look at Weebly’s Business Plan at $25 per month or Squarespace’s Basic eCommerce plan which will run you $26 per month. You can always upgrade your package again further down the road should you need to. As usual, I’m afraid to say that there’s no clear winner and which website builder you should choose, depends entirely on your personal circumstances. If you don’t have much time and you simply need the easiest builder, then Weebly is the one for you. Also, if cost is a major factor and you want to start off with a free website, then again, Weebly may be your better option. Just keep in mind that their free plan does come with restrictions. However, if you’re looking for a more professional looking website that you can be proud of, you have even a small budget, and you have some time to go through a slightly steeper learning curve, then I honestly don’t think you’ll regret choosing Squarespace. The only real way to decide test them both. Sign up for free, take your time and choose the one you feel the most comfortable with. If you have any questions, or you’d like to share your experiences on either Weebly or Squarespace (good or bad), then let me know in the comments section below and I’ll get back to you ASAP! Welcome! I’m Lee. I’m definitely no “techie” but I do have years of experience creating websites for myself and others (never again) lol. I created this site to guide you through this brave new world of do-it-yourself website builders and help you find the right platform for your business or project. So, kick off your shoes and make yourself at home. Oh, if you need any help along the way, just ask.